The first time I ever visited Guyana was in July 1997. Back then, I was working for UNDP, running a global project called the Sustainable Development Networking Programme, SDNP, whose primary goal was to promote access to information via the use of new technologies such as the Internet. At the time, the Internet was still in its early stages, and not many people were aware of the internetwork, never mind using it. My visit, supported by both colleges and competent Guyanese experts, was to launch the first ever public (and free!) Internet center in the country. Part of the job was to get a dedicated connection between the site, which was hosted by UNDP Guyana but had a separate and independent entrance, and the local ISP, GTT. All required equipment had previously been purchased in the US and shipped to Georgetown a couple of weeks before my arrival. All other technical details such as server and router configuration, domain names and DNS settings, etc. were completed before I departed New York. By the end of the week, the site was up and running. It opened to the public the following week. As the initiative also had the support of the Prime Minister, it got widespread local press coverage. Almost 8 years later the SDNP site evolved into Devnet, supporting efforts to promote the local Development Gateway chapter, among many other things. I was back In Georgetown at the end of last month, over 19 years after my first visit. The city has indeed changed for the best, except perhaps for traffic during rush hours which, according to most taxi drivers I spoke to, it’s getting to be a real issue with no short-term solutions at hand. I also met former colleagues who helped set up the old SDNP and have now moved to other activities. Memories light the corners of my mind, indeed. What about the evolution of the Internet since? Here we should also include the rapid diffusion of mobiles which most of us could not have predicted at the end of the last Millennium. Figure 1 below shows relevant data for both Internet and mobile subscriptions.1 There is no 2016 estimate for mobile subscriptions. GSMA says mobile subscriptions are now over 80%, a number which seems on the high side given data for previous years. See https://www.gsmaintelligence.com/markets/1426/dashboard/. Clearly, the growth of mobile subscriptions has outpaced that of Internet users since 2003. But the gap seems to be getting smaller, especially since 2010. Figure 2 below used absolute numbers for the same variables and adds a trend for each. Both Internet user and mobile subscriptions show the common flat S-curve trend (slow start, rapid acceleration, and then gradual deceleration). 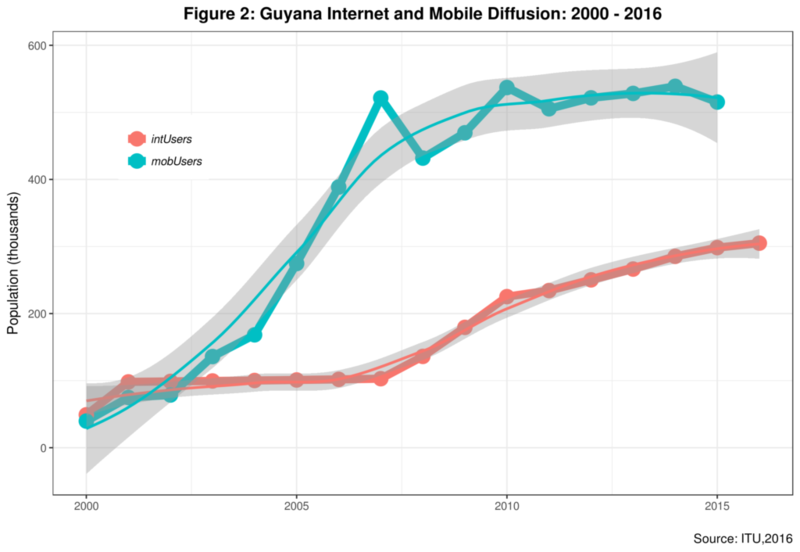 While mobiles seemed to have taken off early in the new Millennium, Internet user acceleration only took place after 2006, 9 years after SDNP Guyana was launched. 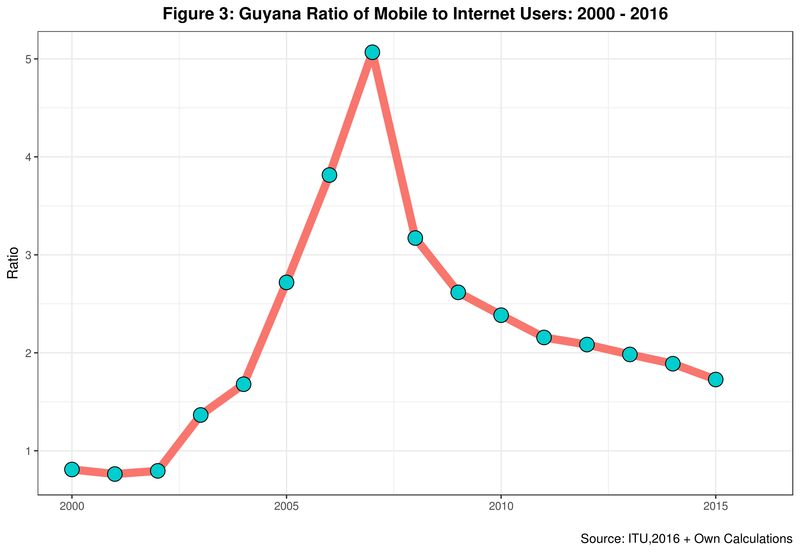 Keep in mind that less than 40% of Guyana’s population has access to the Internet. So room for additional growth here is entirely feasible. Figure 5 below presents the evolution of the ratio of mobile subscriptions to Internet users. In essence, this allows us to compare the yearly growth of each category. As expected, the growth of mobiles outpaced that of the Internet from 2002 until its peak in 2007. At that time, there were 5 mobile subscriptions per Internet user. Even since however, the Internet is catching up. And that trend is expected to continue shortly as mobile subscriptions have less room (and people) to grow. Unfortunately, data disaggregated by the 10 regions that exist in the country is not available. Population distribution, however, is skewed towards the coastline. 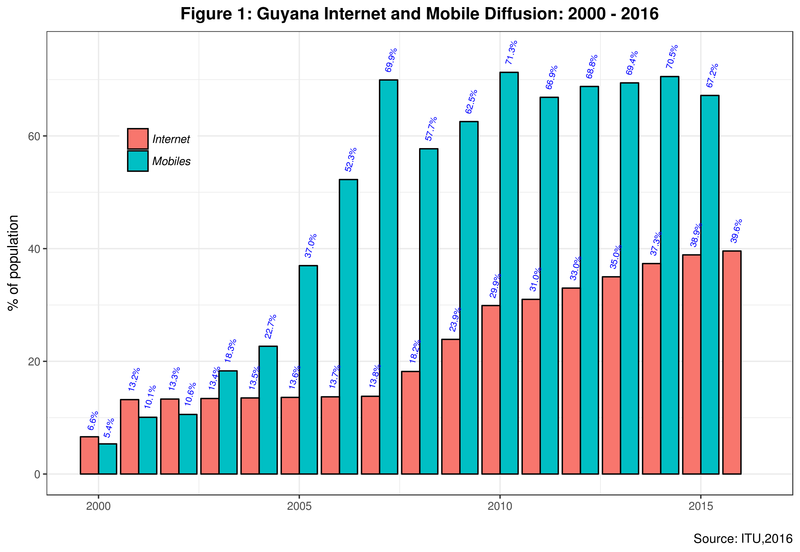 For starters, bear in mind that while Guyana is not a small country in size,2 Guyana is actually over 30% larger than say Bangladesh, a country that has a population of over 150 million people. its population size is less than 1 million inhabitants. Overall population density is around 3 persons per squared kilometer. However, its most populous region which includes the Capital, Georgetown, has a density of over 100 persons per squared kilometer.3 Data from the 2012 National Census. The Hinterland is thus not only sparsely populated, but it is also relatively far from the main urban centers along the coast. How can these populations benefit from receiving essential public services using new technologies? That is what I am working on now. 1. ⇧ There is no 2016 estimate for mobile subscriptions. GSMA says mobile subscriptions are now over 80%, a number which seems on the high side given data for previous years. See https://www.gsmaintelligence.com/markets/1426/dashboard/. 2. ⇧ Guyana is actually over 30% larger than say Bangladesh, a country that has a population of over 150 million people. 3. ⇧ Data from the 2012 National Census.